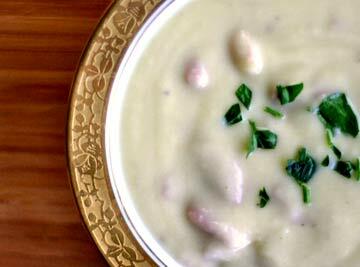 Potato soup is one of my favorites and a real comfort food, especially on cold days. If you prefer, substitute onions for the scallions. Its delicious either way. With hearty bread and a salad, youll have a meal in minutes. Place potatoes, scallions, celery, chopped ham, parsley, salt and water in large saucepan. Bring to boil, cover and reduce to medium heat. Boil slowly for about 10 minutes, or until potatoes are soft. Mash mixture with whisk to break apart some of the potatoes. Add milk and black pepper to soup, and heat just until boiling. Remove from heat, and ladle into bowls. Top each serving with chopped scallion tops. 2 Comments on "POTATO SCALLION SOUP"
.-= Carries last blog ..Trash Fest III Official Press Release =-. Carrie, Let me know what changes you make and how it worked out for you. There are plenty of substitutions that would work well in this soup recipe.